Fred: Nice new plants! I'm curious about something, since I don't have any of the plants you just bought. Only one pic shows a little bit of dried up sheath (sarong ?) 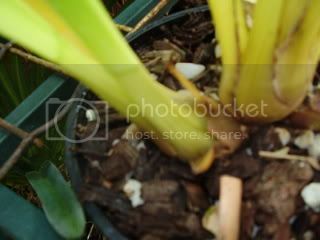 at the base of the pbulbs. Has it been removed or just fallen off? I only have catts. and I recently read that that dried up material should be removed so it's not a hiding place for bugs. Your comments? thank u for the wonderfuol othread , Fred! 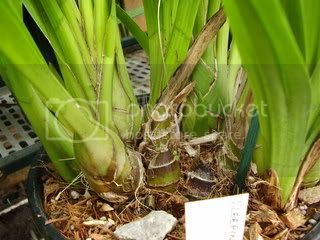 with so many questions on what pseudobulbs look like I thought this thread will help. 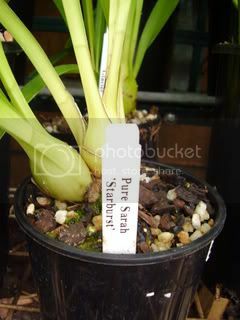 if you have any other pseudobulbs so share please pose here for all of us to see. Fred, thank you for making this thread. 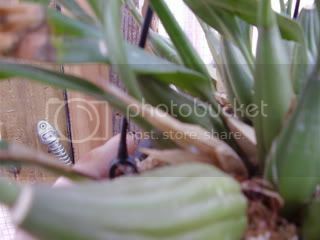 I have noticed on my Brassia pseudobulbs, newly forming knobs. Are these normal? I'm wanting to say they are normal growth, it just seems to be coming from an unusual place. Please help with info. As you can see, these knobs aren't necessarily on newer pbulbs. Never knew, always wondered but never thought to ask about removal of sheath. 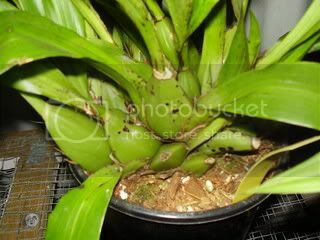 Is this something you do when the stalk/pseudobulb has matured because I removed the sheath from my sick dendrobium before re-potting it and suspected that I may have done damage to it then? 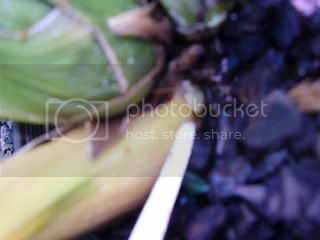 That stalk felt (almost) sticky and wondered if it was needed to somehow protect it until possibly more stability/growth had occurred. P.S. Beautiful pics as always Fred. 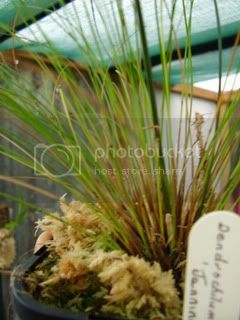 Sandra, Yeah I never pull or cut anything off a plant unless it is 1) clearly and unquestionably dead, dried up, and brown, or 2) it is diseased. i do remove old dead sheaths but only occasionally and only when they easily pull away with a gently tug. remove half at a time would be an idea ? 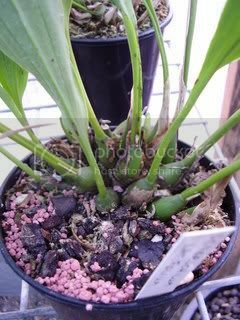 also it is important to say when doing this with cyms one has to be very careful as infront of the dead groath or old leaves that have a split at the base threr is either a flower spike forming or a new growth. caution is a must as the young growths will snap off. Fred....hmmm you know I haven't actually given it much thought. 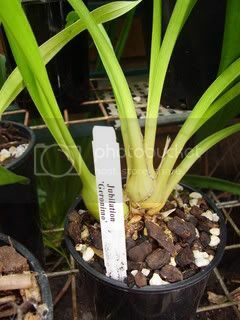 I only pull the dead, dried-up leaf bases off a Cymbid bulb if I am cutting off and potting up back bulbs. 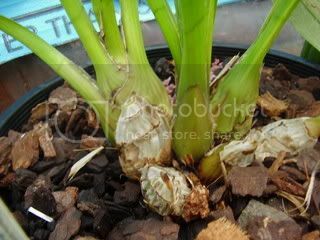 I believe it is helpful to do this in this instance because i believe the chlorophyl in the back bulbs makes energy for the plant, which is helpful in starting a new lead. 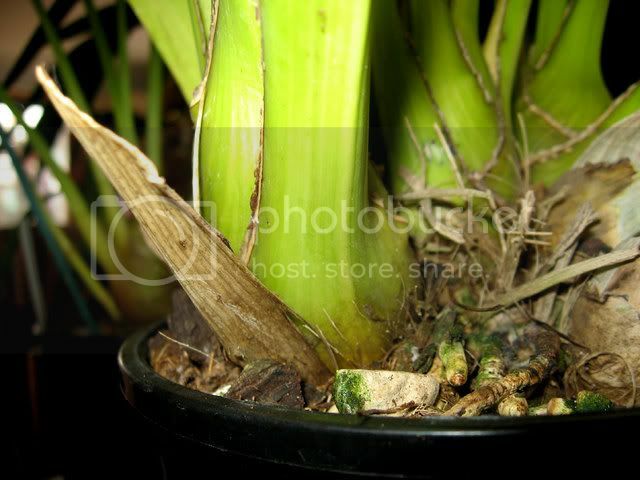 If the clorophyl in th ebulb is covered up by dead leaf bases...no energy making. All my other Cymbids have all the leaf bases left on. 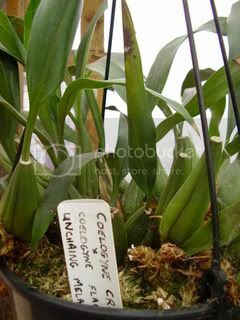 I pull dead dried up sheaths off whichever Coelogyne they'll come off, and off other things. i've just never made much of a habit if it. 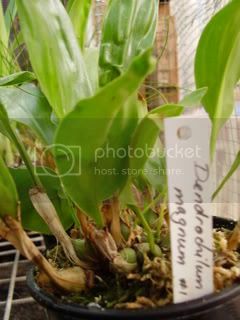 I don't think I've ever pulled one off one of my Dendrobiums. 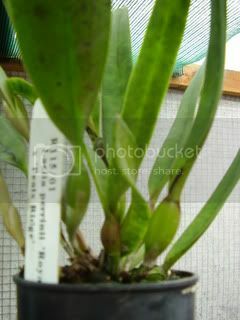 Maybe because I grow mostly Paphs and Phrags, which don't have them, I just don't think of it. 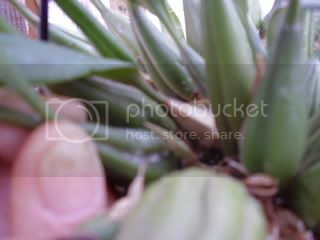 what may make things easer i will take a pic of what i am talking about just to show evryone. by spliting the old dead growth and only taking half off at a time gently pulling the old growth away side ways away from the growth is the best way. I must admit i do that with all my orchids. I have found the same with Coelogynes. Fred, can you clarify what you mean by "spliting the old dead growth and taking off half at a time"? 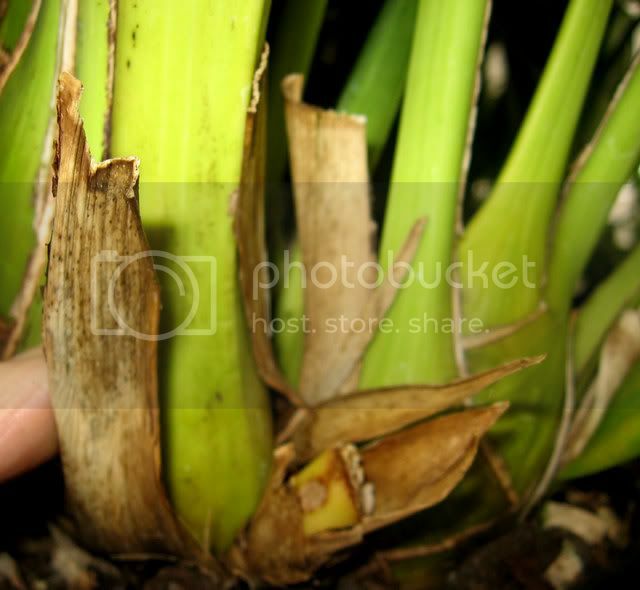 Are you referrign to an actual mature but dead growth, Cymbid leaf bases, or basal sheaths? I'm starting to get a little confused....but then again I've onlt had 2 small sips of my morning coffee. 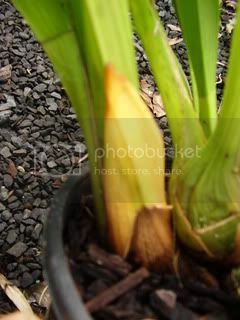 by spliting in two and removing half at a time protect,s any new growth on the base of the pseudobulb. 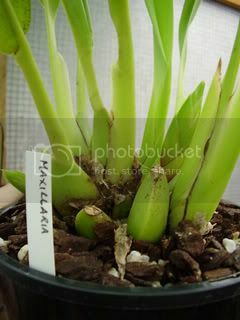 Quote kmarch] Are you referrign to an actual mature but dead growth, Cymbid leaf bases, or basal sheaths? Fred, sorry, I can't see what are you splitting and removing. Last edited by Aniko; 05-19-2007 at 10:04 PM. Hmm, I'm another who hasn't given thought to it, but it makes sense. Looks like I have something to do with my plants during my hols, rather than just looking at them wishing them to grow and flower. 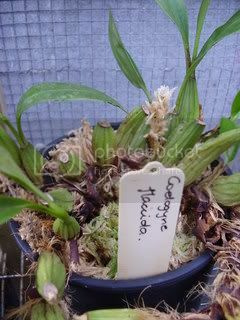 Most of the new plants I have in the GH are not going to flower until next year, and some the year after. 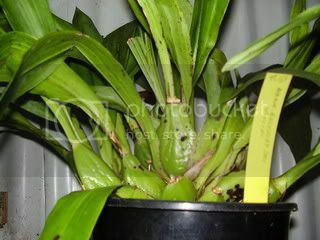 Its about spliting and removing old dead leaves on cumbidiums and other orchids. Well I'm finished with my coffee and am thinking about like I did a few posts ago. I'm afraid your additional pics didn't help Fred as I know pretty well what new growths and "eyes" look like. That wasn't what I was having trouble understanding. But no matter. I think my original comments are still applicable. 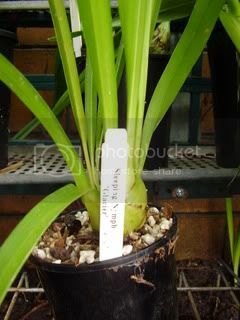 1) I wouldn't cut anything (old growths, basal sheaths, leaves, etc., etc.) off unless it is clearly dead, dried up and brown or diseased. 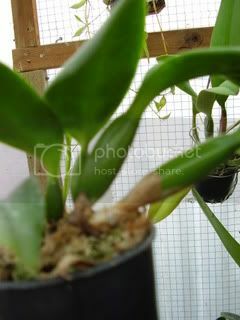 I'm not sure I think it is necessary to be pulling all this dead stuff off an orchid. In the wild no one goes around and pulls off dead basal sheaths and dead leaf bracts and things like that. 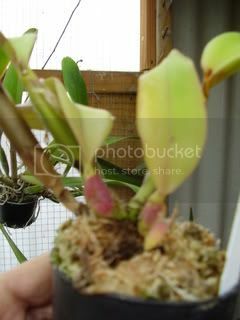 2) I'd exercise great care around any new growths, eyes, sprouts, spikes, etc. I think this is just ordinary common sense and probably obvious to everyone. 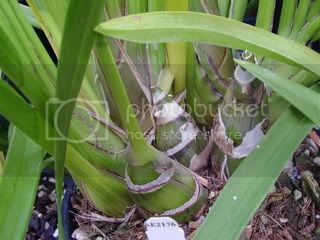 I'd not go cutting and pulling stuff around new growths. If I had a Cymbid back bulb that was unquestionably dead (i.e. if it were black, dried up, soft and mushy, or something like that) I'd just take a pair of garden shears and cut it off (one clip). I think trying ot cut it in half and then cut off each half seems unnecessarily complex to me. The less time any sharp impliment is near any good growth the better (at least in my world). 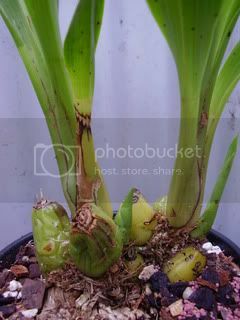 I don't make a habit of pulling dead leaf bases off my Cymbidium pseudobulbs. Maybe if I were going to show one of them I'd do it. When I do I do often split it in half (by pulling it apart) and then pull each half off. 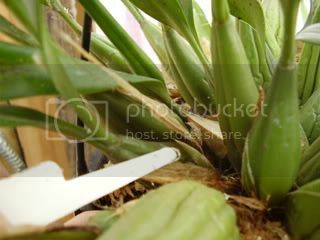 I usually do this when the plant is wet like after a rain because soaked up sheaths are weaker and give more readily. 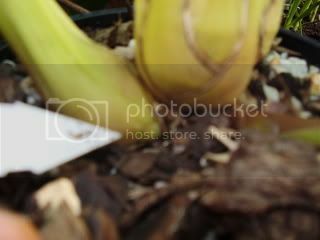 The only time I've done this is when seperating and potting up back bulbs. 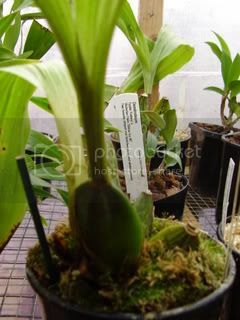 The basal leaf bracts on Coelogyne flaccida are really tough; difficult to remove. Why bother? 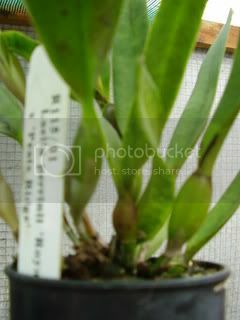 Quite honestly, I think I've spent more time posting on this topic thread that I spend doing this stuff for my orchids for a whole month. By that I mean I guess I dont' think it's all that important, certianly not critical. kevin I am showing that the dead basal sheaths, leaves can be removed. I agree fully with your statment. 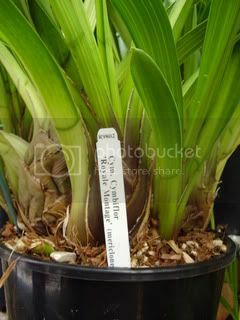 Quote] I don't make a habit of pulling dead leaf bases off my Cymbidium pseudobulbs. Maybe if I were going to show one of them I'd do it. When I do I do often split it in half (by pulling it apart) and then pull each half off. 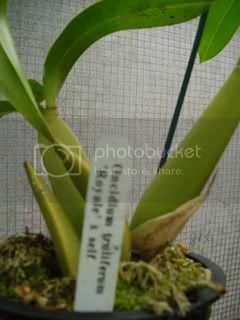 Quote] The basal leaf bracts on Coelogyne flaccida are really tough; difficult to remove. Why bother? Why do i bother the plant looks better. 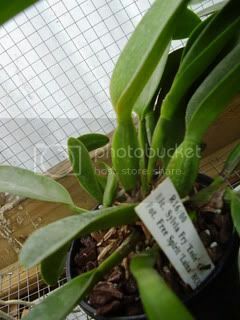 I have seen so many orchid growers in the orchid society here they all do the same thing. Like yourself not all people agree with doing this. kevin if you were judging orchids in an orchid show and you saw an orchid that had all the dead basal sheaths still on the orchid would you look at that orchid a second time ? 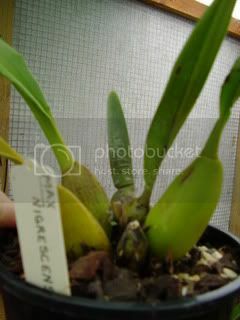 most people would say that the orchid is untidy and wake right passed. I know 2 orchid judges that own an orchid store here and they do the same thing. Hi Fred....I'm lauging at myself (yet again) as it seems, in spite of all my muddled brain activity, we were pretty much "on the same page" as they say these days. 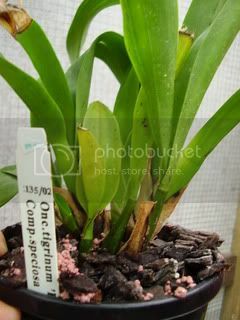 I also think that this thread is an awesome topic for all the members to see just what can be done with orchids. 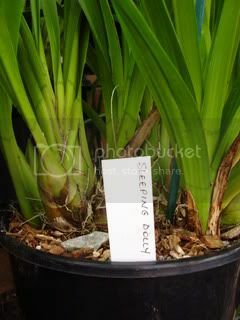 Thanks for the pictures of various pseudobulbs. It still seems pretty hard for some of us, who have 'untrained eyes' and inexperience to differentiate some of them in your pictures. I will keep referring to your pictures until I get a bit of a firm grip in identifying the different species. I am not sure if I read it here or somewhere else on the 'net but I remeber one 'article' said that in nature wind and other natural elements get rid of the sheaths and the bracts ( I added that word to my vocabulary today! ) 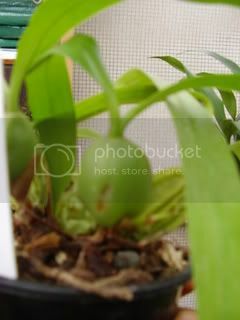 you are talking about and that we should aid the plants by removing them periodically. And I have been doing it ever since. But the Cyms havepretty tough ones to be able to handle easily. To make it worse they are also in awkward position to be able to access easily. I try to wet them before removing them with forceps and curved scissors or scalpel. Offers a bit of relief in accessibility. I will await the conclusion of your discussion here to see what is best. quote]I try to wet them before removing them with forceps and curved scissors or scalpel. Offers a bit of relief in accessibility. 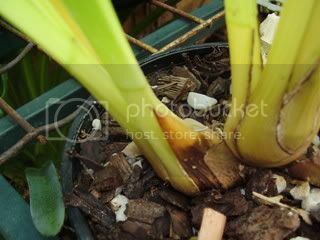 I am thinking on the lines if you wet the old growths, basal sheaths and leaves with wetting them one would have to be careful not to get the new growths wet as they will rot being so young. I will not do it from hereon. And should I be careful when spraying the cyms. 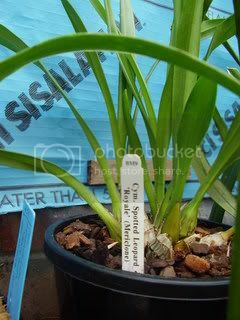 everyday not to get the water on to the new shoots?. I have 4 or 5 new shoots coming out from some Cyms. 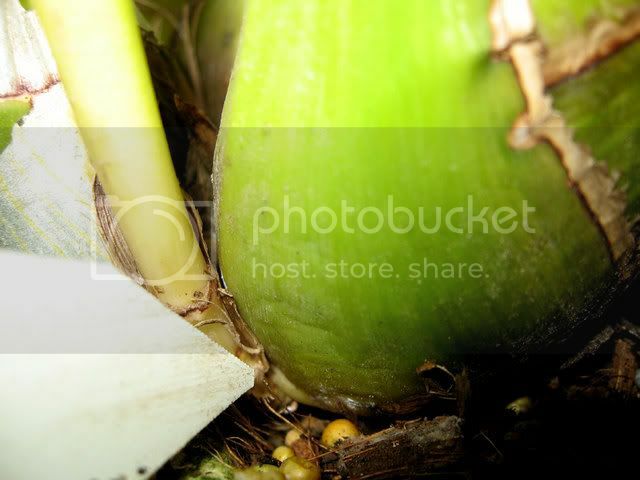 If the water beads and rolls down the center of the new growths the growth will rot from the inside out. I pulled off some old dry sheaths from a cymbid and managed to also pull off two new growths along with the sheaths. From now on I shall not remove old sheaths until the new growth is well and truly on the way, and even then I shall use great caution. 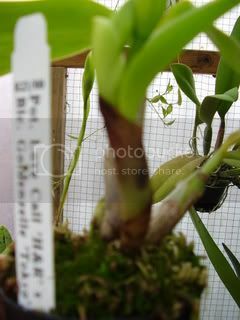 I never remove sheaths from dendrobiums, they fall off as the stalk matures. However if you enter your cymbid in a competition you should carefuly clean it up, VERY CAREFULLY. Tess when you do this it has to be done with caution not to break the new growths. 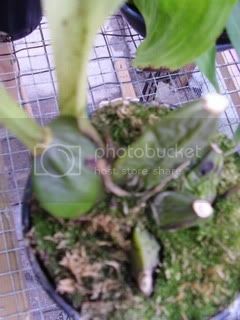 that is why I split the dead growth in two first. Yes Fred, I also split the old dried growth, but I still managed to harm the new growth, I must say the old growth was very tough and hard. I pulled off some old dry sheaths from a cymbid and managed to also pull off two new growths along with the sheaths. Yeah this is unfortunate and precisely the reason i recommend that folks leave the sheaths alone unless they're cleaning the plant up for a show or something. I rarely if ever pull the dead sheaths off, even for shows sometimes i don't. 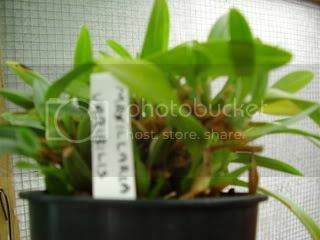 I always remove yellowing leaves. I really can't help myself. And Fred, I understand exactly what you mean my splitting the leaf in two, sometimes more parts. 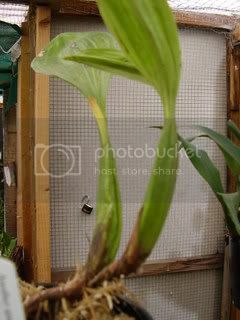 If you split the leaf from the tip to the base, and then pull one half of the leaf at a time, up and in the direction circling the bulb then you shouldn't damage any growths. 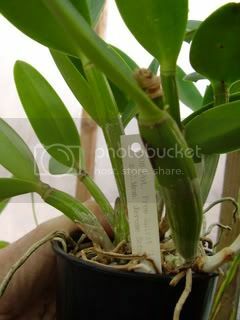 It's when you pull on a leaf in a horizontal, away-from-the-bulb motion that the growths get damaged. I hope my description is somewhat possible to understand! 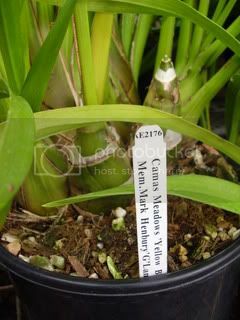 I for one have a habit of cleaning my Cymbidiums of all yellow, brown, and dead leaves. I do as Fred does. First rip the brown sheath in half (sometimes more than that) and pull each sections outward from the center. This is the easiest and safest way to remove them. If you don't split them first it is sometimes impossible to remove. It seems to get stuck between the bulbs. I find scales love to hide under the old dead leaves and sheaths. 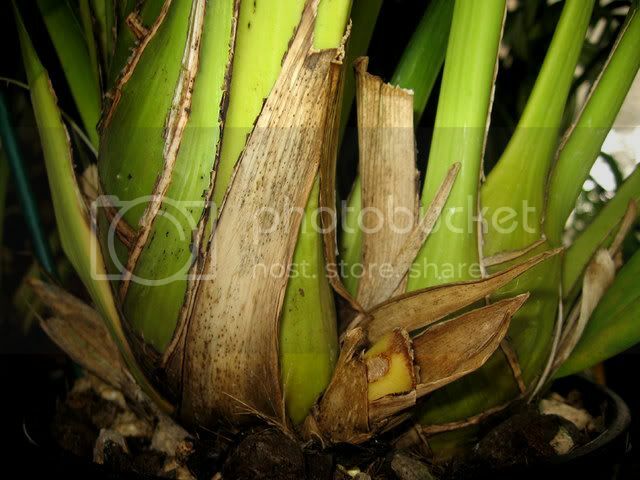 You do sometimes lose a new growth or even a spike if you are not careful. 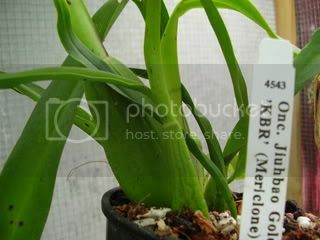 For me it's worth the sacrifice to have neat and pretty green plants without brown dead leaves/sheaths. 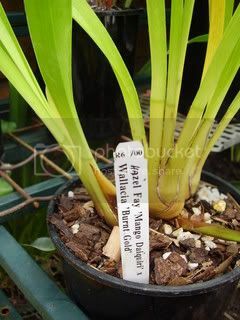 I also snip off all the leaves that are spotted, bent, brown, or yellowing. I prefer the clean green look. I see there was a question posed to me some time ago that went unanswered. My apologies, I just simply missed it. It depends on what I'm judging for. 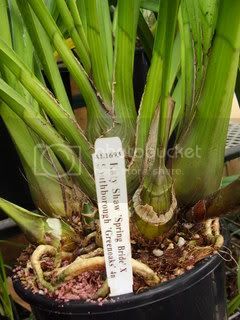 If we're judging for flower quality the basal pseudobulb sheaths are irrelevant and it doesn't make any difference if they were there or not. There's nothing in the AOC handbook on judging that says these sheaths need to be removed. If I were judging for a cultural award, an award in which the whole plant is considered, the vigor and health of the whole plant would be considered. 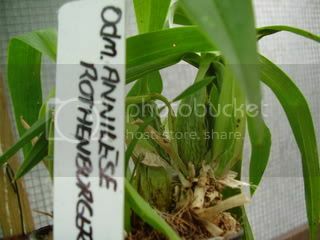 That means the sheaths may or may not be a factor depending on what they indicate about the health of the plant. Are they AOC judges? If so they have no basis for doing this according to the AOC judging handbook.